Under-valued for a century and a half, the perfected joys of Mendelssohn’s music for solo piano are further unearthed in this third volume of our complete series from Howard Shelley where fascinating early works sit happily alongside Book 4 of the ‘Songs without words’ and the wonderful Caprices of opus 33. One of the very great pianists of the nineteenth century, Felix Mendelssohn Bartholdy (1809–1847) achieved legendary status for his performances and improvisations alike, though his piano compositions generally have not withstood comparison with the very best keyboard music of the century. The one piano sonata he published was deemed not to have broken new ground after Beethoven’s path-breaking thirty-two; he created no large-scale cyclic works comparable to Robert Schumann’s hybrid literary/musical fantasies for the instrument; his meticulously crafted Lieder ohne Worte exuded for many a refined romanticism not as soul-searching as the miniatures of Chopin or Brahms; and nowhere did his technical demands on the pianist challenge the Promethean exertions of Liszt. Today, in the midst of a full-scale Mendelssohn revival, Howard Shelley’s survey of the complete solo piano music in six volumes offers a welcome opportunity to revisit and reassess this repertoire. As we now know, Mendelssohn composed or began nearly two hundred works for piano. Nevertheless, he saw only about seventy through the press, released in seventeen opera from the Capriccio, Op 5 (1825), to the sixth volume of the Lieder ohne Worte, Op 67 (1845). Some twenty-five additional pieces appeared posthumously in eleven additional opera. The remainder, whether fully drafted or fragmentary, were left to his musical estate or have disappeared. 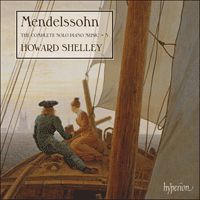 The third volume of Howard Shelley’s recordings of Mendelssohn’s piano music offers works composed over two decades, between 1821 and 1841, and thus connects the remarkable achievements of the student period with Mendelssohn’s music from the noon of fame. The earliest composition is the G minor piano sonata, Op 105 (possessing a deceptively high opus number, for the sonata was published posthumously in 1868, when the progression of works released after his death in 1847, beginning with Op 73, had already reached beyond Op 100); the latest composition is the fourth volume of the Lieder ohne Worte, Op 53. With few exceptions—the cycle of Preludes and Fugues, Op 35, and Variations sérieuses, Op 54, forthcoming in volumes 4 and 5, are among them—Mendelssohn tended not to compose large-scale piano works, preferring instead to explore smaller-scale keyboard genres and intimate miniatures. Among them is the diminutive Scherzo in B minor, WoO2, conceived in London in June 1829, not long before Mendelssohn gave the English premiere of his Midsummer Night’s Dream Overture. Like the Shakespearean inspiration, the scherzo is filled with light staccato work in the treble register, and abrupt shifts from the minor to major mode. Unlike his contemporary Chopin, who experimented with expanding the genre of the scherzo, Mendelssohn shrank its dimensions here considerably to elf-like proportions, as if content to say more with less. But in the case of the Scherzo a capriccio in F sharp minor, WoO3 (1835), Mendelssohn did paint on a broader canvas, and explored his tripping, mischievous scherzo style over the course of three hundred bars, which unveil a full-length, madcap movement based on three distinct themes. The work appeared in the 1836 installment of Maurice Schlesinger’s Album des pianists, alongside Chopin’s four Mazurkas, Op 24, and contributions by lesser virtuosi. Coterminous with the Scherzo a capriccio are the Three Caprices, Op 33 (1836), which elicited from Robert Schumann an imaginative review in the Neue Zeitschrift für Musik. Schumann discerned three contrasting moods in the caprices, ranging from a ‘gentle grief’ in the first, a seductive allure in the second that ‘could make the most faithful of girls unfaithful for a few moments’, to a ‘speechless, restrained wrath’ in the third. Each caprice is prefaced by an introduction that suggests Mendelssohn extemporizing or preluding at the piano, with rising arepggiations over a slowly sinking bass in the first, a few sketch-like chords in the second, and a stately Adagio exordium in the third. All three are linked to fast sonata-form movements that display a variety of keyboard textures—insistent repeated pitches in No 1, pedalled cross-rhythms in No 2, and martellato passages in No 3. Five years later, in 1841, Mendelssohn published the fourth volume of his Lieder ohne Worte, Op 53, with a dedication to Sophie Horsley, daughter of the English glee composer William Horsley (1774–1858), and elder sister of Charles Edward Horsley, who at the time was studying composition and piano with Mendelssohn in Leipzig. The very first piece of Op 53 had in fact been written for Sophie in 1839, while the second, conceived a few years earlier in 1835, was originally destined for Clara Wieck, whom Mendelssohn had described when he met her at the age of fifteen in 1834 as ‘a bit quiet and shy’ and as playing ‘ganz prachtvoll Clavier’. As in other volumes of his piano Lieder, Mendelssohn offered in Op 53 different types with contrasting keys, tempos and textures, and yet was able to mould the six miniatures into a coordinated whole. The key scheme of the six pieces shows the deft hand of the composer: they begin with flat keys, in descending order from four flats (A flat major) to three (E flat major), two (G minor) and one (F major), then move to the neutral A minor for the penultimate Lied, and conclude with its parallel major with three sharps, A major. In terms of tempos, the six pieces divide into two groups of three each, moving from slow (Andante in No 1, Adagio in No 4) to fast (Allegro in Nos 2 and 5), and very fast (Presto in No 3, Allegro vivace in No 6). One other work that reveals Mendelssohn addressing issues of virtuosity is the Étude in F minor, WoO1, originally composed in 1836 as a prelude, in all likelihood to introduce the fugue in F minor, the fifth of six fugues eventually assembled in the Preludes and Fugues, Op 35, but then jettisoned from that project. As a standalone piece, the étude eventually saw the light of day in the Méthode des méthodes, a pedagogical work released in 1840 by Ignaz Moscheles and the Belgian music critic F-J Fétis. The basic texture of the étude consists of three layers, a bass line played by the left hand, a series of churning arpeggiations shared by the left and right hands, and a soprano melody projected by the right hand. The design is a variant of another texture explored by virtuosi in the 1830s, the so-called three-hand technique associated with Thalberg, but used by Liszt, Mendelssohn, Fanny Hensel, and other pianists, in which the melody is embedded in the middle register where it is shared by the two hands, while the left and right surround it with a bass line and treble figurations, respectively. Mendelssohn remained sceptical of virtuoso displays for their own sake, but the étude, like the Lied ohne Worte Op 53 No 6, shows that occasionally he did respond to newer fashions of pianism. Felix Mendelssohn Bartholdy (1809–1847) a beau être un des immenses pianistes du XIXe siècle, entré dans la légende pour ses interprétations comme pour ses improvisations, ses compositions pianistiques, elles, ne soutinrent globalement pas la comparaison avec les toutes meilleures musiques pour clavier de son siècle. De l’avis général, la seule sonate pour piano qu’il publia n’ouvrit pas de nouvelles perspectives après les trente-deux pionnières de Beethoven; il ne conçut pas d’œuvre cyclique à grande échelle comparable aux fantaisies pianistiques littéraro-musicales de Robert Schumann; pour beaucoup, ses Lieder ohne Worte ciselés exsudaient un romantisme sophistiqué moins introspectif que celui des miniatures de Chopin ou de Brahms; et jamais la technique qu’il exigea du pianiste ne vint défier les exercices prométhéens de Liszt. Aujourd’hui, en pleine résurrection de Mendelssohn, l’intégrale de la musique pour piano réalisée par Howard Shelley en six volumes offre une occasion bienvenue de revisiter et de réexaminer ce répertoire. Comme nous le savons désormais, Mendelssohn écrivit ou entama presque deux cents œuvres pour piano, dont seulement soixante-dix furent publiées de son vivant, réparties en dix-sept opera allant du Capriccio, op.5 (1825), au sixième volume de ses Lieder ohne Worte, op.67 (1845). Quelque vingt-cinq autres pièces parurent à titre posthume dans onze opera supplémentaires. Le reste, qu’il soit complètement ébauché ou fragmentaire, se trouve dans son héritage musical ou a disparu. Le troisième volume de musique pour piano de Mendelssohn enregistré par Howard Shelley présente des œuvres composées au cours d’une période d’une vingtaine d’années, entre 1821 et 1841, et relie ainsi les remarquables réussites de l’époque estudiantine à la musique de l’apogée de sa célébrité. L’œuvre la plus ancienne est la Sonate pour piano en sol mineur, op.105 (dont le numéro d’opus élevé est trompeur, car cette sonate fut publiée à titre posthume en 1868, lorsque la succession des œuvres publiées après sa mort en 1847, qui commence avec l’op.73, avait déjà dépassé l’op.100); la composition la plus tardive est le quatrième volume des Lieder ohne Worte («Romances sans paroles»), op.53. À de rares exceptions près—le cycle des Préludes et Fugues, op.35, et les Variations sérieuses, op.54, qui seront enregistrés dans les volumes 4 et 5—, la tendance générale de Mendelssohn en matière de composition n’était pas tournée vers des œuvres pour piano d’envergure; il préférait plutôt explorer des genres pianistiques à plus petite échelle et des miniatures intimes. Parmi celles-ci, le minuscule Scherzo en si mineur, WoO2, conçu à Londres en juin 1829, peu avant que Mendelssohn donne la création anglaise de son ouverture du Songe d’une nuit d’été. Comme l’inspiration shakespearienne, le scherzo baigne dans le staccato dans le registre aigu avec de brusques glissements du mineur au majeur. Contrairement à son contemporain Chopin, qui fit l’expérience d’un scherzo élargi, Mendelssohn réduit ici considérablement ses dimensions, comme s’il se contentait d’en dire davantage avec peu de choses. Mais dans le cas du Scherzo a capriccio en fa dièse mineur, WoO3 (1835), Mendelssohn peint sur une toile plus vaste et explore son propre style de scherzo espiègle et sautillant sur trois cents mesures, dévoilant un long mouvement insensé basé sur trois thèmes distincts. Cette œuvre fut publiée en 1836 dans le feuilleton l’Album des pianistes de Maurice Schlesinger, avec les quatre Mazurkas, op.24, de Chopin et des contributions de moindres virtuoses. Contemporains du Scherzo a capriccio, les Trois Caprices, op.33 (1836) suscitèrent de la part de Robert Schumann un article plein d’imagination dans la Neue Zeitschrift für Musik. Schumann discerna dans ces caprices trois atmosphères contrastées, un «doux chagrin dans le premier», des attraits séduisants qui «pourraient rendre la plus fidèle des jeunes filles infidèle le temps d’un instant» dans le deuxième, une «colère retenue et muette» dans le troisième. Chaque caprice est préfacé par une introduction qui suggère que Mendelssohn est en train d’improviser ou de préluder au piano avec des arpèges ascendants sur une basse qui s’enfonce lentement dans le premier, quelques accords esquissés dans le deuxième et une imposante introduction Adagio dans le troisième. Les trois sont liés à des mouvements rapides de forme sonate qui présentent diverses textures pianistiques—des notes répétées et insistantes dans le nº 1, des contre-rythmes avec la basse en forme de pédale dans le nº 2 et des passages martelés dans le nº 3. Cinq ans plus tard, Mendelssohn publia le quatrième volume de ses Lieder ohne Worte («Romances sans paroles»), op.53, en 1841, avec une dédicace à Sophie Horsley, fille du compositeur de glees anglais William Horsley (1774–1858) et sœur aînée de Charles Edward Horsley, qui étudiait alors la composition et le piano avec Mendelssohn à Leipzig. En fait, la toute première pièce de l’op.53 fut écrite pour Sophie en 1839, alors que la deuxième, conçue quelques années plus tôt en 1835, était à l’origine destinée à Clara Wieck que Mendelssohn avait décrite lorsqu’il l’avait rencontrée à l’âge de quinze ans en 1834 comme «un peu silencieuse et timide» et comme jouant «ganz prachtvoll Clavier» («un piano absolument magnifique»). Comme dans d’autres volumes de ses Romances sans paroles pour piano, Mendelssohn mélange dans l’op.53 différents types de tonalités, de tempos et de textures contrastés tout en parvenant néanmoins à façonner les six miniatures pour en faire un tout coordonné. Le plan tonal des six pièces montre la main habile du compositeur: elles débutent avec des tonalités bémolisées, en ordre descendant de quatre bémols (la bémol majeur) à trois (mi bémol majeur), deux (sol mineur) et un (fa majeur), puis passe au neutre la mineur pour l’avant-dernière romance et conclut avec son homologue majeur avec trois dièses, la majeur. En termes de tempos, les six pièces se divisent en deux groupes de trois, allant de lent (Andante dans la première, Adagio dans la quatrième) à rapide (Allegro dans la deuxième et la cinquième) et très rapide (Presto dans la troisième, Allegro vivace dans la sixième). Une autre œuvre dans laquelle Mendelssohn aborde des questions de virtuosité, l’Étude en fa mineur, WoO1, fut composée à l’origine en 1836 comme un prélude, selon toute vraisemblance pour introduire la fugue en fa mineur, la cinquième des six fugues finalement réunies dans les Préludes et Fugues, op.35, mais ensuite rejetée de ce projet. Cette étude vit finalement la lumière du jour isolément dans la Méthode des méthodes, ouvrage pédagogique publié en 1840 par Ignaz Moscheles et le critique musical belge F.-J. Fétis. La texture de base de cette étude se compose de trois couches, une basse jouée par la main gauche, une série d’arpèges tourbillonnants partagée par les deux mains et une mélodie soprano confiée à la main droite. La conception est une variante d’une autre texture explorée par des virtuoses dans les années 1830, la technique dite des trois mains associée à Thalberg, mais utilisée par Liszt, Mendelssohn, Fanny Hensel et d’autres pianistes, où la mélodie est enchâssée dans le registre médian, partagée entre les deux mains, tandis que la gauche et la droite l’entourent respectivement d’une basse et de figurations aiguës. Mendelssohn restait sceptique à propos des démonstrations de virtuosité pure, mais cette étude, comme le Romance sans paroles op.53 nº 6, montre qu’à l’occasion il pouvait répondre aux nouvelles modes du monde pianistique. Felix Mendelssohn Bartholdy (1809–1847) errang als einer der größten Pianisten des 19. Jahrhunderts sowohl mit seinen Darbietungen als auch mit seinen Improvisationen einen legendären Status, jedoch haben seine Kompositionen für Klavier im Großen und Ganzen dem Vergleich mit den besten Klavierwerken des 19. Jahrhunderts nicht standgehalten. Die einzige Klaviersonate, die er veröffentlichte, wurde nach Beethovens bahnbrechenden 32 Sonaten nicht als innovativ erachtet; er komponierte keine großangelegten zyklischen Werke, die mit Robert Schumanns hybriden literarisch-musikalischen Phantasien für das Klavier vergleichbar gewesen wären; seine sorgfältig gearbeiteten Lieder ohne Worte strahlten für viele eine kultivierte Romantik aus, die aber nicht so weit in sich ging, wie die Miniaturen eines Chopin oder eines Brahms; und nirgends kamen seine technischen Anforderungen an den Pianisten den prometheischen Strapazen gleich, die Liszts Werke mit sich brachten. Derartige Ansichten zu der Klaviermusik Mendelssohns spiegelte fast das ganze 20. Jahrhundert über die gängige Meinung über den Rang des Komponisten wider. Verschiedene Faktoren, darunter eine Antihaltung gegenüber dem Viktorianismus (auf seinen regelmäßigen Englandreisen war Mendelssohn auch durch Audienzen bei der Königin ausgezeichnet und als viktorianischer Gentleman begrüßt worden, was ihm bei späteren zeitkritischen Abhandlungen zur Last gelegt wurde) sowie das Verbot seiner Musik unter den Nazis (obwohl er als Lutheraner getauft worden war, war er der Enkel des jüdischen Philosophen Moses Mendelssohn), zersetzten seinen Ruf. So wurde er als Lieferant gemütlicher Salonmusik betrachtet, dessen Vorliebe für den komplexen bachischen Kontrapunkt dazu führte, dass er sich zu sehr auf historische Vorbilder bezog, und dessen Musik eine süßliche Sentimentalität preisgab, die völlig im Widerspruch zum modernen Musikgeschmack stand. Anlässlich des 150. Jubiläums des Geburtsjahrs Mendelssohns im Jahre 1959 schrieb Stanley Bayliss in der Musical Times, dass Mendelssohns Musik zwar „Zauber, Charme, Klarheit, Brillanz, Verve, Beschwingtheit und Schliff“ besäße, all diese Qualitäten jedoch nicht jenes prägnante Urteil der Nachkriegskultur—„Mendelssohn geht nicht besonders in die Tiefe“—abschütteln könnten. Diese Ansichten standen im krassen Gegensatz zu dem kometenhaften Aufstieg des Komponisten in den 1830er und 40er Jahren sowie seiner raschen Kanonisierung. Als außergewöhnliches Wunderkind wurde er von Goethe und Heine als zweiter Mozart betrachtet und auch Robert Schumann beschrieb ihn als Mozart des 19. Jahrhunderts. Als Komponist trug er wesentlich zu jedem wichtigen Genre der Zeit bei, mit der Ausnahme der Oper (obwohl er sich durchaus darum bemüht hatte—er sah zahlreiche potenzielle Libretti durch und entschloss sich letztendlich für Die Lorelei, die er jedoch vor seinem Tod nicht mehr vollendete). Als Dirigent transformierte er das Leipziger Gewandhausorchester in eine der führenden Musikinstitutionen seiner Zeit. Als unermüdlicher Herausgeber und Interpret der Werke Bachs und Händels setzte er sich für Kontinuität in der europäischen klassischen Tradition ein, aus der er immer wieder auch selbst Inspiration schöpfte. Und als Pianist fand sein eleganter Stil bei vielen Kritikern Anklang, darunter auch bei einem seiner ersten Biographen, Wilhelm Adolf Lampadius, der 1865 schrieb: „Mendelssohns Virtuosität war kein blosses Gaukelspiel, keine enorme Fingerfertigkeit, die blos wegen des Flitterstaates der Triller, chromatischer Läufe und Octavengänge da zu sein scheint, sondern das, wovon das Wort abgeleitet ist, virtus, wahre männliche Tugend, eine Beharrlichkeit, die alle mechanischen Hindernisse überwand, aber nicht, um musikalischen Lärm, sondern um Musik zu machen, um den Geist werthvoller Tonstücke aus den verschiedensten Zeitaltern der Kunst zur vollkommensten Darstellung zu bringen. Die äussern Vorzüge seines Spiels waren ein höchst elastischer Anschlag, ein vorzüglicher Triller, überhaupt Eleganz, Rundung, Sicherheit, vollkommene Deutlichkeit, Kraft und Zartheit, jedes an seinem Platze. Der Hauptvorzug bestand aber eben darin, dass M. jedes Stück, wie schon Goethe andeutete, von der Bach’schen Epoche heran bis zu seinen eigenen Productionen vollkommen in seinem Character spielte …“. Inzwischen befinden wir uns inmitten einer großen Mendelssohn-Renaissance, wobei Howard Shelleys Gesamtaufnahme der Soloklavierwerke in sechs Teilen eine willkommene Gelegenheit bietet, dieses Repertoire neu aufzugreifen und neu zu bewerten. Wie wir heute wissen, komponierte, beziehungsweise begann, Mendelssohn fast 200 Werke für Klavier. Nichtsdestotrotz wurden zu seinen Lebzeiten nur etwa 70 veröffentlicht, die in 17 Opera, vom Capriccio, op. 5 (1825), bis zum sechsten Teil der Lieder ohne Worte, op. 67 (1845), herauskamen. Etwa 25 zusätzliche Stücke erschienen nach seinem Tod als elf weitere Opera. Die restlichen Werke, ob sie nun in vollständigen Skizzen oder fragmentarischer Form vorlagen, verblieben in seinem musikalischen Nachlass oder gingen verloren. Der dritte Band von Howard Shelleys Gesamtaufnahme der Klaviermusik Mendelssohns befasst sich mit Werken, die über zwei Jahrzehnte—zwischen 1821 und 1841—komponiert wurden und damit einen Bogen von Mendelssohns beeindruckenden studentischen Kompositionen zu den Werken des Zenits seines Ruhms schlagen. Die früheste Komposition dabei ist die Klaviersonate g-Moll, op. 105 (deren hohe Opuszahl täuscht—die Sonate wurde nach seinem Tod im Jahre 1868 herausgegeben, als die Bezifferung der posthum veröffentlichen Werke, angefangen bei op. 73, op. 100 bereits überschritten hatte); die letzte Komposition ist das vierte Heft der Lieder ohne Worte, op. 53. Von wenigen Ausnahmen abgesehen—darunter der Zyklus von Präludien und Fugen, op. 35, sowie die Variations sérieuses, op. 54, die für Teil 4 und 5 der vorliegenden Aufnahmereihe vorgesehen sind—tendierte Mendelssohn in seinen Klavierwerken dazu, sich auf kleinere Genres und intime Miniaturen zu beschränken, anstatt Werke mit großer Anlage zu komponieren. Ein Beispiel dafür ist das winzige Scherzo in h-Moll, WoO2, welches er im Juni 1829 in London konzipiert hatte, lange vor seiner englischen Premiere der Ouvertüre zum Sommernachtstraum. Ebenso wie jenes von Shakespeare inspirierte Werk ist das Scherzo ein lichterfülltes Staccato-Stück im oberen Register, in dem abrupte Wechsel zwischen Dur und Moll stattfinden. Anders als sein Zeitgenosse Chopin, der das Genre des Scherzos experimentell erweiterte, ließ Mendelssohn es hier derart schrumpfen, dass es sozusagen elfenartige Proportionen annahm, als wolle er mehr mit weniger ausdrücken. Im Falle des Scherzo a capriccio in fis-Moll, WoO3 (1835), bediente Mendelssohn sich allerdings einer größeren Leinwand, auf die er ein umher tippelndes, keckes Scherzo von über dreihundert Takten malte, wobei sich ein verrückter Satz in voller Länge präsentiert, dem drei verschiedenartige Themen zugrunde liegen. Das Werk erschien in der Ausgabe des Jahres 1836 von Maurice Schlesingers Publikationsreihe Album des pianistes, zusammen mit Chopins Vier Mazurken, op. 24, und Beiträgen von geringeren Virtuosen. Die an das Scherzo a capriccio angrenzenden Drei Capricen, op. 33 (1836), inspirierten Robert Schumann zu einer phantasievollen Besprechung in der Neuen Zeitschrift für Musik. Schumann beschrieb drei unterschiedliche Stimmungen in den Capricen, von „leichterem Weh“ in der ersten, einer verführerischen Anziehungskraft in der zweiten, die „das liebendste Mädchen auf einige Augenblicke untreu machen“ könne, bis hin zu „einem verhaltenen sprachlosen Ingrimm“ in der letzten. Allen drei Stücken ist jeweils eine Einleitung vorangestellt, die Mendelssohn sozusagen beim Extemporieren oder Präludieren am Klavier darstellen. Im ersten Stück erklingen aufsteigende Arpeggien über einem langsam hinabsinkenden Bass, im zweiten einige skizzenartige Akkorde und eine würdevolle Adagio-Einleitung im dritten. Alle drei sind mit schnellen Sonatenform-Sätzen verbunden, in denen diverse Klaviertechniken zum Ausdruck kommen—insistierende Tonrepetitionen in Nr. 1, polyrhythmische Pedal-Figuren in Nr. 2 und Martellato-Passagen in Nr. 3. Fünf Jahre später gab Mendelssohn das vierte Heft seiner Lieder ohne Worte, op. 53 (1841), heraus, das Sophie Horsley, Tochter des englischen Gesangskomponisten William Horsley (1774–1858) und ältere Schwester von Charles Edward Horsley, der zu jener Zeit bei Mendelssohn in Leipzig Komposition und Klavier studierte, gewidmet war. Das erste Stück Opus 53 entstand 1839 für Sophie, während das zweite bereits 1835 konzipiert worden und ursprünglich für Clara Wieck gedacht gewesen war, die Mendelssohn als „ein wenig still u. scheu“ beschrieb, als er die Fünfzehnjährige, die „ganz prachtvoll Clavier“ spiele, 1834 kennengelernt hatte. Ebenso wie in den anderen Heften seiner Klavierlieder komponierte Mendelssohn auch für sein Opus 53 unterschiedliche Werke in gegensätzlichen Tonarten, Tempi und Anlagen, und doch gelang es ihm dabei, diese sechs Miniaturen zu einem zusammenhängenden Ganzen zu verbinden. Die Tonartenabfolge der sechs Stücke zeigt sein kompositorisches Geschick: sie beginnen mit B-Tonarten in absteigender Reihenfolge, ausgehend von vier Bs (As-Dur) zu drei (Es-Dur), zwei (g-Moll) und schließlich einem B (F-Dur), dann kommt das neutrale a-Moll im vorletzten Lied und der Zyklus schließt mit der Varianttonart A-Dur mit drei Kreuzen ab. Was die Tempi anbelangt, so teilen sich die sechs Stücke in zwei Dreiergruppen, die sich jeweils von langsamer Gangart (Andante in Nr. 1, Adagio in Nr. 4), zu einer schnellen (Allegro in Nr. 2 und 5) und dann sehr schnellen (Presto in Nr. 3, Allegro vivace in Nr. 6) entwickeln. Ein weiteres Werk, in dem Mendelssohn sich mit virtuosen Stilmitteln auseinandersetzt, ist die Etüde in f-Moll, WoO1, die 1836 ursprünglich als Präludium entstanden war, wohl als Partnerstück für die Fuge f-Moll—die fünfte von insgesamt sechs Fugen, die letztendlich als Präludien und Fugen, op. 35, zusammengestellt wurden—, dann jedoch als solches wieder verworfen wurde. Als Einzelstück erschien sie dann schließlich in der Méthode des méthodes, ein klavierpädagogisches Werk, welches 1840 von Ignaz Moscheles und dem belgischen Musikkritiker François-Joseph Fétis herausgegeben wurde. Die Grundstruktur der Etüde besteht aus drei Ebenen, nämlich einer Bass-Linie, die von der linken Hand gespielt wird, einer Reihe von herumwirbelnden Arpeggien, die in beiden Händen erklingen, und einer Sopranmelodie, die von der rechten Hand gespielt wird. Diese Anlage ist eine Variante einer Struktur, die von den Tastenvirtuosen gegen Ende der 1830er Jahre eingesetzt wurde—die sogenannte dreihändige Technik, welche mit Thalberg in Verbindung gebracht wird, aber auch von Liszt, Mendelssohn, Fanny Hensel und anderen Pianisten eingesetzt wurde, wobei die Melodie im mittleren Register erklingt und auf beide Hände verteilt ist, während die Linke und Rechte sie jeweils mit einer Bassstimme und Sopran-Figurationen umgeben. Mendelssohn war stets skeptisch gegenüber virtuosen Kunststückchen um ihrer selbst willen, doch zeigt diese Etüde, wie auch das Lied ohne Worte, op. 53 Nr. 6, dass er sich trotzdem gelegentlich mit den neueren Modeerscheinungen in der Klaviermusik auseinandersetzte.